Los Angeles apartment complex on fault line gets waterproofing solution. A luxury multifamily apartment complex in the heart of Hollywood, CA, 1840 N. Highland Ave., is steps away from the world-famous Hollywood Bowl and Hollywood Boulevard. The 118-unit complex sits on an 8,144-sq.-ft.lot, and presented several challenges. The Alquist-Priolo Earthquake Fault Zone runs through the property boundary. EPRO Services Inc. (EPRO), Wichita, KS, provided blindside waterproofing and building- envelope protection for the complex, using 70,000 sq.ft. of its E.Protect+ and E.Proformance below-grade solutions. Three stories of the structure sit below grade. 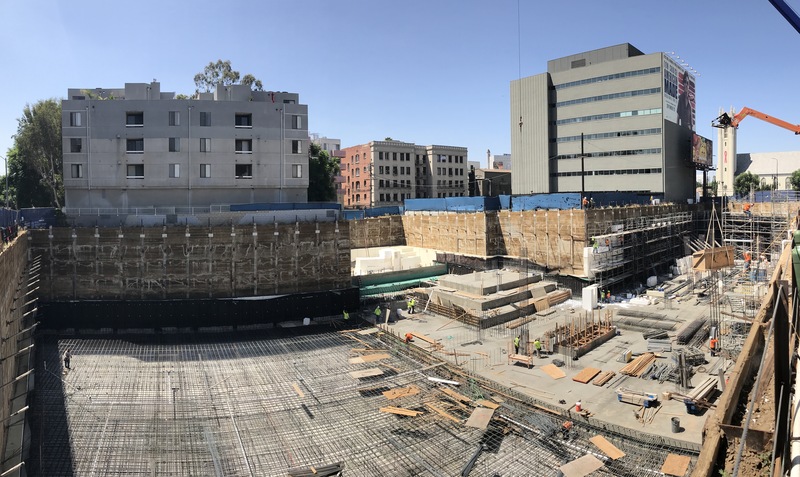 The team had to install a 2-ft.-thick layer of Geofoam between the shoring system and below-grade shotcrete walls, which were put in place to reduce and eliminate seismic-movement impact on the building’s structure. E.Protect+ Underslab was used to protect the building foundation and blindside vertical walls for water intrusion considerations. In addition, E.Protect+ transitioned to E.Proformance Shoring system above the design water table. Complexity increased as the company’s negative-side waterproofing systems were applied directly to the Geofoam layers for below-grade waterproofing purposes. The transition between E.Protect+ (hydrostatic) and E.Proformance (non-hydrostatic) was at 2-ft. above the high historical water-table level and extended to grade. The waterproofing system was carefully detailed around many pipe penetrations and several pits for elevators and utilities. 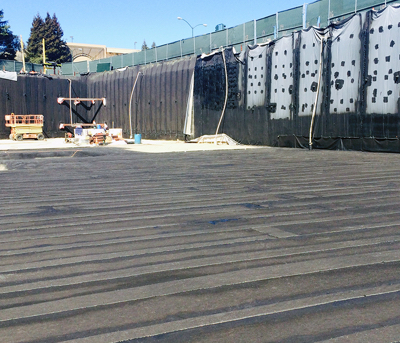 Complexity increased as the company’s negative-side waterproofing systems were applied directly to the Geofoam layers for below-grade waterproofing purposes. 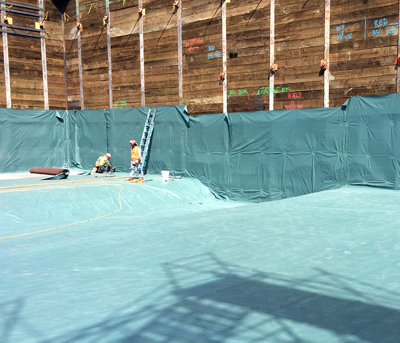 The E.Proformance Shoring blindside waterproofing system was used for the non-hydrostatic waterproofing system. E.Proformance was a solution at grade level where it was transitioned to a hot-rubber horizontal waterproofing system, a landscaping area for planters, and a stucco wall system. Despite the high level of complexity and the presence of hydrostatic conditions, working closely with the project team enabled EPRO to provide a 15-yr., no-dollar-limit warranty to the developer. Providing such a robust warranty encouraged the entire project team to collaborate with the company to anticipate and overcome challenges in the field. EPRO’s E.Series systems features built-in layers of redundancy. 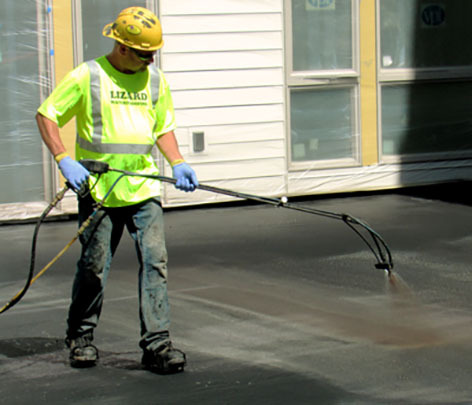 The redundancy is achieved by combining different types of waterproofing materials to leverage the positive attributes of each and eliminate a continuous seam. The company calls this Redundant Field-Installed Composite Design. Founded on the belief that redundant systems provide the best protection, the company provides composite waterproofing and vapor-intrusion systems for all types of performance needs and project conditions.